Al Habib Ahmad Mashhur bin Taha Al-Haddad, was one of the most powerful Alawi influences in East Africa and is generally considered to have been the “Renewer” of Islam in those parts. He was born in the town of Qaydun, one of the towns of Hadhramawt, in the year of 1325 H (1907). 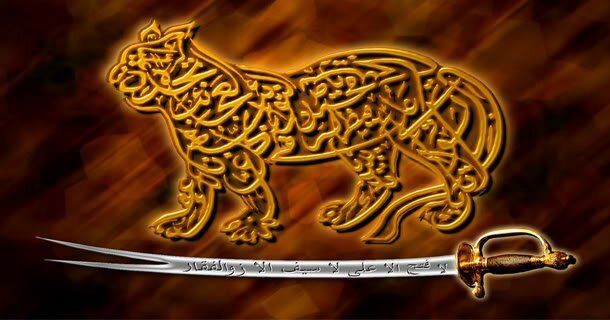 He was raised up in the bosom of ‘ilm and taqwa and righteousness by his mother, the virtuous and saintly Safiyya, daughter of the great Imam Taher ibn Umar al-Haddad, from whom she received her instruction in the Quran and religious sciences. His early education was taken over by another two great masters of the house of Al-Haddad, Habib Abdallah and Habib Alawi, the two brothers who founded the Ribat of Qaydun, the school of religious sciences where Habib Ahmad was soon to become, at an early age, a teacher. Then he joined the Ribat at Tarim and studied under the firmly established Master as well as its ulama’. Knowledge in Islam must be supported by unbroken chains of transmission to the Prophet, may God’s blessings and peace be upon him. Those who receive one or more sciences or part thereof from a master and are considered by him worthy, receive the ijaza, the authorisation to transmit it, in their turn, to others. Habib Ahmad, as has always been the Alawi custom, sought to receive the ijaza from as numerous master as was possible. 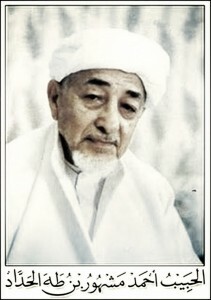 Habib Ahmad learned from dozens of shaykhs in Hadramawt, the Hijaz, Indonesia and East Africa. As for the Shaykh under whose tutelage he attained his spiritual unveiling, he was al-Imam ar-Rabbani Ahmad bin Muhsin al-Haddar. He travelled to Indonesia to add to his sum of knowledge and supplement his heart-to-heart and soul-to-soul corpus of ma’arif from the firmly established Masters who were there. He also went there for the purpose of trade so that he may thereby gird his integrity. However, his stay there did not last long. In the early 1350’s H (1931) he settled in Mombasa, the major seaport of Kenya. 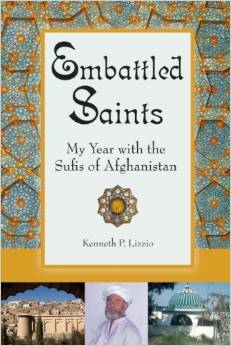 In addition to his business affairs, he held study circles in mosques as well as at his own home. By the grace of Allah, he climbed up the African firmament as a luminary amongst its luminaries, a leader, a guide, a reconciler, a religious and social eminence. People gathered around him and turned up in large numbers to listen to his distinguished darsas. He was the ultimate authority to whom people turned in matters of religion and Shari’a. He extinguished a lot of innovations and quickened to life a lot of Sunnas. He took innumerable trips to the villages in the Kenyan bush, calling the tribes to Islam. His fame spread across all of East Africa and he was soon to become known simply as “Habib”. In 1375 H (1955). he moved to Kampala in Uganda where he was to stay for 13 years. Eventually, he gave up commerce and devoted himself exclusively to teaching and calling people to Allah. Many African youths benefited and graduated from his school and went on to become Qadis, teachers and caller-unto-Allah. He himself also went into the bushes and forests that he may call people unto Allah – he travelled to Uganda, Congo, Tanzania and to other East African countries, as a caller unto Allah, as a guide. He succeeded in building many mosques and schools. Countless idol worshippers and Christians embraced Islam at his hands. Habib Ahmad’s work in Kenya and Uganda led to a massive increase in the number of Muslims. He was a tireless teacher and all those who wanted knowledge, baraka, advice, or comfort flocked to his house. Arabs, Indians and Africans in their thousands came to him and benefited from his knowledge and the light radiating from his presence and also from his du’a. Habib Ahmad Mashhur was amongst servants of Allah who singled themselves to exclusively serve Allah, preserve the awrad and the Sunna and the supererogatory prayers. He would not fail to rise for tahajjud, both when at home and away; he walked in the footsteps of his ancestors, he was their very replica in their conduct a living exemplar of how the Prophet’s Sunna is to be lived. Every movement, every word, every smile immediately evoked the radiant presence of the Prophet r. None looked at him without remembering God. His awesome dignity imposed courtesy on his visitors and excluded frivolity, yet his gentle, gracious manners and equal respect for everyone soothed their hearts and made them forget their trouble and experience the serenity and joy of being accepted by one so close to God and His Messenger. 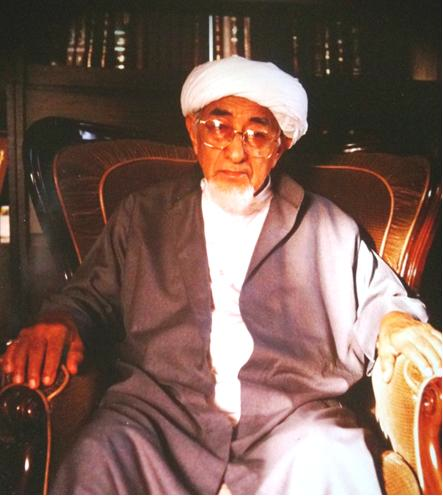 Al-Habib Ahmad Mashur Al Haddad passed away on Wednesday 14 Rejab 1416 (7 December 1995 M) at the age of 87. His life had been in complete service to Allah in all its total manifestation. He was buried at Ma’la, at Mekah Al Mukarammah. Sayyid Abdullah bin Muhammad bin Ahmad Mashhur al-Haddad narrates that his grandfather, Habib Ahmad Mashhur al-Haddad (may Allah have mercy upon him and benefit us by him), gave permission for the following to be recited in order to see the Prophet ﷺ.
O Allah, bestow Your blessings upon our Master Muhammad, the Beloved of the All Merciful, the master of all creation, the one who is present with whoever bestows prayers upon him in every time and place.